Our most popular model for full-size kitchens. Large (almost three feet long) and very functional, this rack includes 12 hooks and holds lots of pots and utensils! The grid (included) multiplies the storage capacity and versatility of the rack! Especially designed for homes with smaller kitchens, also condos, town homes and apartments. STRONG EASY INSTALLATION IN DRYWALL! New - technology steel anchors (included) eliminate the need to attach rack to joists or studs. Position rack in DRYWALL anywhere you want. Holding strength is many times the weight of the rack and all the pots you can hang from it. QUICK EASY ASSEMBLY. No handyman required. Assemble in minutes - just align parts and screw together. All hardware is in the box. (To see step-by-step instructions click here). 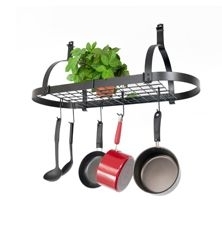 Enclume MPR 02 Rectangular Pot Rack Enclume PR37 Reversible Arch Rack Enclume PR2wg Circle Ceiling Rack "Dutch Crown"